Save the world with a cupcake and eat it, too? 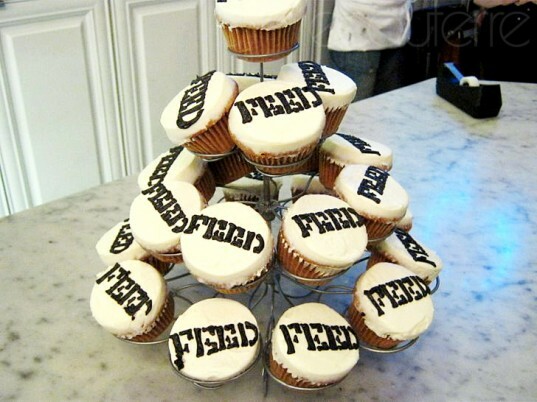 FEED Projects and the Little Cupcake Bakeshop in New York City recently launched a shop-within-a-shop to feed hungry children and support disaster-relief efforts in Japan. For every FEED Japan bag, T-shirt, teddy bear, or carbon-neutral baked good sold, a portion of proceeds will help FEED further its socially conscious mission. We caught up with FEED co-founder Lauren Bush to find out more about the collaboration, what made her want to use fashion to help the world, and the sustainable fashion brands that inhabit her own closet. As a Japanese American, I think it’s so wonderful that FEED is supporting Japan with its new FEED Japan bag and T-shirt. Can you tell us a little bit about them and how people can help Japan by purchasing them? FEED was happy to be able to respond and raise much-needed funds to help in Japan’s disaster relief by quickly creating the FEED Japan bag and T-shirt . Both items were launched soon after the earthquake and the money raised will go back to supporting aid organizations such as UNICEF and others working on the ground to provide help to those who need it most. “I feel so lucky to wake up every day and get to run a small business and design,” Bush says. It’s pretty obvious that you’re a supporter of responsibly sourced and produced fashion. Could you tell us about a few sustainable brands and pieces you have in your own closet? A few sustainable brands I have some pieces of are Stewart & Brown, TOMS, and John Patrick Organic, among others. You could have easily started a regular old clothing line with no humanitarian element. What made you decide you wanted to help the world through fashion? I feel so lucky to wake up every day and get to run a small business and design, and it is just extra rewarding that the purpose is to help the world and give back through it all. I really can’t imagine doing it any other way! A big thank you to Lauren Bush for making time to talk to us despite her crazy-busy schedule. If you’d like to pick up your own FEED bag, T-shirt, or cupcake to help Japan, swing by either one of the Little Cupcake Bakeshop’s locations on Prince St. in Manhattan or Third Ave. in Brooklyn. Or visit FEED’s online shop to make your purchase. The shop-within-a-shop with the best of both worlds: FEED's cause-promoting merchandise and Little Cupcake Bakeshop's sweet treats. FEED Project's co-founder Lauren Bush (right) with fashion consultant Julie Gilhart. The staff of Little Cupcake Bakery and its carbon-neutral goodies. Special FEED Japan cupcakes to mark the collaboration. And co-branded totes that will provide 10 meals to schoolchildren in need. The Little Cupcake Bakeshop is powered by wind and uses Energy Star-rated appliances and energy-efficient windows. Aside from having truly delectable baked goods, the staff is wonderful. A shout-out to Luigi who went above and beyond to find this author a FEED bag to buy even though they were short. Eco-model/entrepreneur Summer Rayne Oakes, eco-fashion writer and stylist Emma Grady, and Little Cupcake Bakeshop owner Massimo LoBuglio pose for a pic. A miniature to-scale version of the store, taking the shop-within-a-shop concept to a literal level. If you'd like to pick up your own FEED bag, shirt, or cupcake to help Japan, swing by either one of the Little Cupcake Bakeshop's locations in Manhattan and Brooklyn. A tower of cupcakes that say "feed me" rather than "eat me." Both the FEED Japan bag and T-shirt were launched in the earthquake's aftermath. The money raised will go support aid organizations such as UNICEF and others working on the ground to provide help to those who need it most.